(right) KUAF 91.3-FM radio host Kyle Kellams, leads a question-and-answer session with those who spoke on transit initiatives in neighboring states. 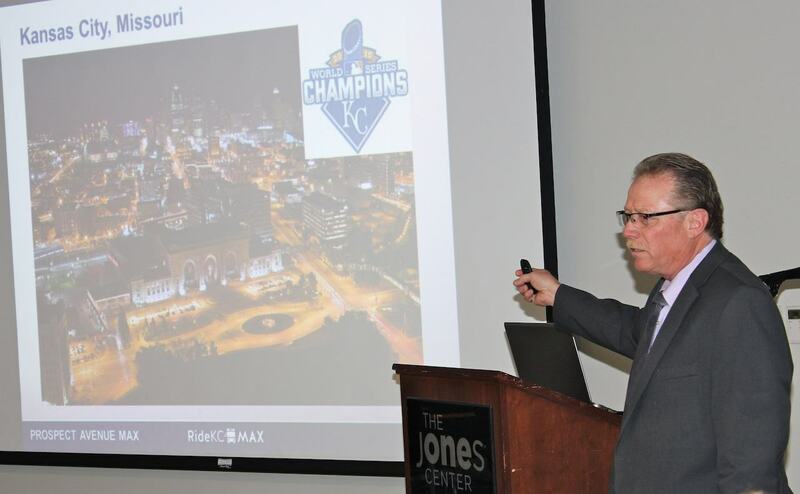 Transit officials and planners from Kansas City, Oklahoma City and Tulsa spoke about ongoing transportation-related projects in their regions, offering insights on how Northwest Arkansas can implement transit plans here. 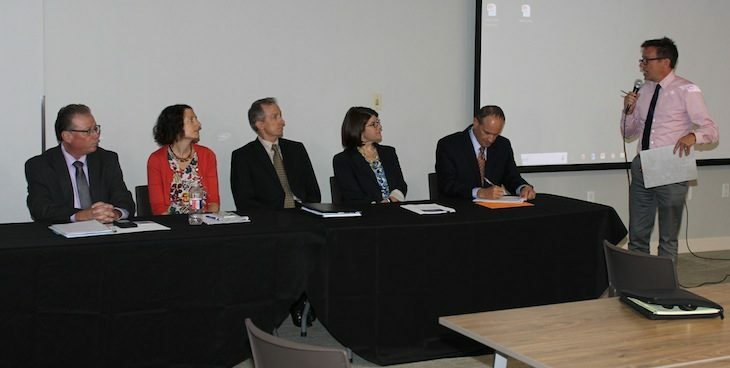 On Wednesday (Aug. 8), officials from the neighboring regions spoke in the fourth of a four-part speaker series on mobility. Northwest Arkansas Regional Planning Commission hosted “Growing Mobility for a Growing Region, Part 4: Our Next-Door Neighbors’ Transit Initiatives” at the Jones Center in Springdale. Now that the speaker series is completed the next step will be to develop a 10-year transit plan, said Tim Conklin, transportation programs manager for the commission. This fall, a consultant will be hired to help develop the plan, which should be completed over the next 12 to 18 months. Information gathered from the speaker series will be used in the planning process. Following are the speakers who participated in the fourth part of the speaker series: Keith Sanders, chief engineer for the Kansas City Area Transportation Authority; Laura Machala, planner for Mid-America Regional Council; Dawn Warrick, planning director for Tulsa; Ted Rieck, general manager of transit provider Tulsa Transit; Jason Ferbrache, director of transit provider Embark in Oklahoma City; and John Sharp, acting executive director for the Association of Central Oklahoma Governments. Sanders discussed Kansas City’s streetcar service and that the city looks to expand the service and its existing 2-mile line. He also spoke about the city’s bus service, which has 80 regional routes and 50,000 weekday riders. The city worked to develop bus rapid transit service after previous votes failed for light rail or streetcar service. The plan was to develop a new system without new taxes and to expand the service to more choice riders. Between 40% and 50% of the system provided service to riders who were dependent on transit. The first bus rapid transit line opened in 2005 and has more than 6,000 daily riders. The second route opened in 2011 and has 8,000 riders. A third line should open in 2019 and projected to have 6,000 daily riders. An advantage to bus rapid transit compared to light rail is cost. A mile of light rail ranges between $50 million and $70 million, compared to $5 million a mile for bus rapid transit. Also, a year after the line opened in 2011, he said crime along the route declined 23%. The line that will open in 2019 will include platforms to easily board buses, technology improvements such as 55-inch touchscreens along the route and traffic signal priority that will use an algorithm to determine how it will receive priority at traffic signals. A late bus or one with 30 passengers might receive more priority at traffic signals. Keith Sanders, chief engineer for the Kansas City Area Transportation Authority, speaks in the fourth speaker series on mobility at the Jones Center in Springdale. Part four of the series focused on transit initiatives in neighboring regions. Sanders said an advisory committee led to the success of its transit programs. In Tulsa, transit was seen as a last resort to residents, and it also needed an image change, Rieck said. The city developed a long-range plan and renovated a bus to bring the message to the public, generating community interest. Rieck explained that cities often host public hearings requiring the public to come to learn about plans and receive feedback, but over four months, the bus went into neighborhoods to present plans and solicit feedback where residents live. One of the keys to a voter-friendly initiative is to have partners, Rieck said. Tulsa voters approved a sales tax that will in part pay for bus rapid transit, and the first line is expected to start operating in fall 2019. Another line is expected to open in 2021, Warrick said. Rieck said to plan for setbacks. Sharp explained plans to create a regional transit authority that includes six cities in the Oklahoma City area. Oklahoma City has two weighted votes on the authority, and each vote is weighted at 26%, while the other cities have a smaller weighted vote. He said regions that receive federal funding are those that work together. And when building transit project, don’t plan for what’s needed now but for the future. Ferbrache said to work incrementally to improve transit. In 2005, Oklahoma City developed a plan that envisioned what transit should look like in the city. One part of the plan was to establish downtown circulation, and the city is building a streetcar project that’s expected to provide for this circulation. The city improved bus routes by straightening them, and they have a minimum frequency of 30 minutes. Some have a 15-minute frequency. This was completed through city council approval and with general funds, Ferbrache said. Over the past three to five years, the city has added five routes that run until midnight, and it will soon have Sunday routes. Studies can be expensive, but the results can be used to show elected officials the impacts of implementing a plan.